Cristiano Ronaldo's buy-out clause at Real Madrid has been reduced from 1billion euros (£884million) to 120m euros (£106m), according to a report from Spain. OK Diario has reported that the reduction, initially down to 400m euros (£354m) and then 120m euros, was agreed between Real and Ronaldo earlier this year to facilitate a possible summer sale. According to OK Diario, the massively reduced buy-out clause does not apply to Barcelona or any other clubs in Spain, or Paris St Germain. The report also says that since the reduction, Manchester City, Arsenal, Chelsea and AC Milan have informed the superstar forward's agent they would be ready to negotiate a deal in relation to the 120m euros figure. All three English clubs linked to Ronaldo did not comment on the report when contacted by Press Association Sport on Thursday. Press Association Sport has also contacted Ronaldo's representatives for comment. 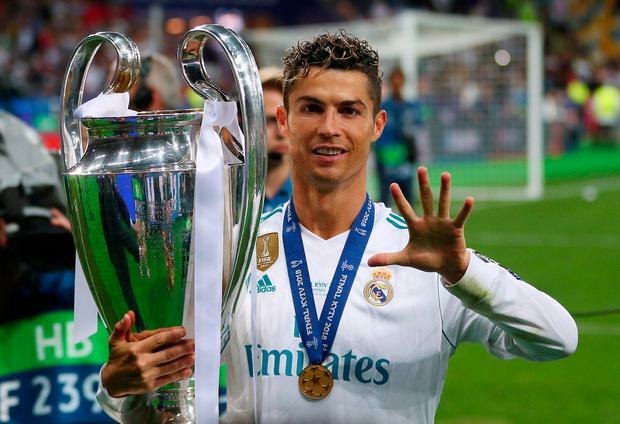 Not for the first time, Ronaldo's future in Spain is the subject of speculation following comments the 33-year-old made in the wake of the Champions League final last month. The Portugal captain, currently preparing for this weekend's World Cup last-16 clash with Uruguay, admitted immediately after the 3-1 victory over Liverpool in Kiev that he could not guarantee he would still be at Real next season, adding that he would "have the opportunity to talk later on". While there has been no update from him since then on his future, there has been a change of management at Real, with Zinedine Zidane resigning and being replaced by Julen Lopetegui. Massive release clauses in players' contracts are commonplace in Spanish football. Brazil forward Neymar joined PSG from Barca, becoming the most expensive player in history, after his 222million euros (£196m) buy-out clause was met last summer. Earlier this month, Barca and France defender Samuel Umtiti's release clause was set at 500m euros (£442m) as he signed a new five-year contract with the club. Kevin Palmer Michy Batshuayi has completed a loan move from Chelsea to Crystal Palace, with the deal finally confirmed more than an hour after the January transfer window had closed. Chris Bascombe As Marouane Fellaini edged closer to his Old Trafford exit, Manchester United confirmed a new five-year contract for Anthony Martial.